Even after spending hours training for her marathon, down-to-earth Tara can't outrun the rumors about the boyfriend she thought was perfect. ...but that's not possible when new-girl Riley arrives in school and changes everything. Suddenly Tara starts to feel things she's never felt before—for anyone—while Whitney Blaire tries to convince her that this new girl is Trouble. Meanwhile, Pinkie’s world begins to crumble as she begins to suspect that the friends she depends on are not the girls she thought she knew. When Riley shows up she doesn't get off on the right foot with Whitney Blaire, who thinks Riley is out to steal Tara's boyfriend Brent. But it isn't Brent that Riley has her eye on, Tara learns that Brent hasn't been exactly honest with her, and misunderstandings multiply. When We Were develops over the course of several months, switching between the view points of Tara, Whitney Blaire, and Pinkie. The misunderstandings and personal demons are believable, though it seemed odd how limited in spread rumors seemed to go, and in the modern days of tampons and women being expect to actually do things on their own the whole "bleeding virgin" thing is almost a pet peeve. I appreciate that Tara's realization that she's attracted to Riley takes time, growing organically as something out the rightness of friendly intimacy rather than a rapid blooming. Before Riley, Tara has considered herself strictly heterosexual, but she comes to realize that perhaps for her attraction is more about the person and less about the gender. An easy read with good character growth, both as individuals and in relation to others. 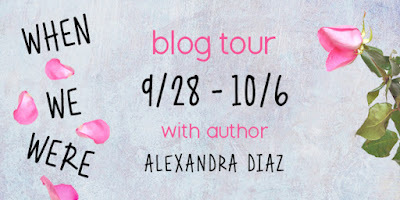 Alexandra Diaz grew up bilingual in Puerto Rico and various U.S. states. Thanks to an over-active imagination, she's always loved creating stories and "what-if" scenarios. She got her MA in Writing for Young People from Bath Spa University in Bath, England and is the author of five young adult and middle grade novels. When she is not writing, she gets paid to walk dogs, teach creative writing, web edit, and parade in costume on stilts; sadly, other things she enjoys—traveling, eating ice cream, and circus aerials—don't pay. Yet. Advanced Reader Copy copy courtesy of Paper Lantern Lit via Netgalley; differences may exist between uncorrected galley text and the final edition.